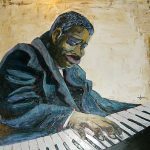 Arthur Tatum Jr. is considered one of the greatest jazz pianists of all time. He became a star in the 1930s, winning fans with his radical reinventions of pop favorites and wowing peers with his ornate arrangements and technique. Our birthday celebration includes a live recital featuring Joe Pane on the piano and supper from the Harlem Cookbook presented at the Bedford Winery Courtyard Speakeasy. Another great, innovative Bedford event! See Events for more information. Copyright 2009 The Design People, Inc.